after cooking than bird breads which incorporate the use of baking powders. A thinner bread means far less waste! KAMUT® Brand flour forms the base for this delicious, beak tempting bread. Nutty flavored KAMUT® Brand flour is a more easily digested grain than other wheat products. Bird Bannock is made with natural, preservative-free Organic ingredients. Our bread contains no baking powder, no sodium or added sugar, no soy, no preservatives or chemicals, and no corn or cornmeal. This dense, crispy bread is ideal for all parrot species; even small beaks relish the gourmet taste. Each package yields one jumbo sized pan ( 9 x 13 ) of healthy Bird Bannock. Cut into squares after cooling and freeze for later use. Full mixing and cooking instructions are on each package - simply add an organic beaten egg and water. 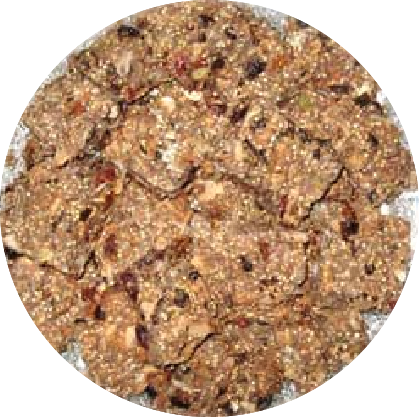 KAMUT® Brand flour, quinoa grain, quinoa flakes, KAMUT® Brand flakes, poppy seeds, unhulled hemp seeds, hulled sunflower seeds, sesame seeds, red chili peppers, carrots, currants, cranberries, Incan berries, unsweetened coconut, almond slices, ground milk thistle seed, hibiscus, ground ginger.